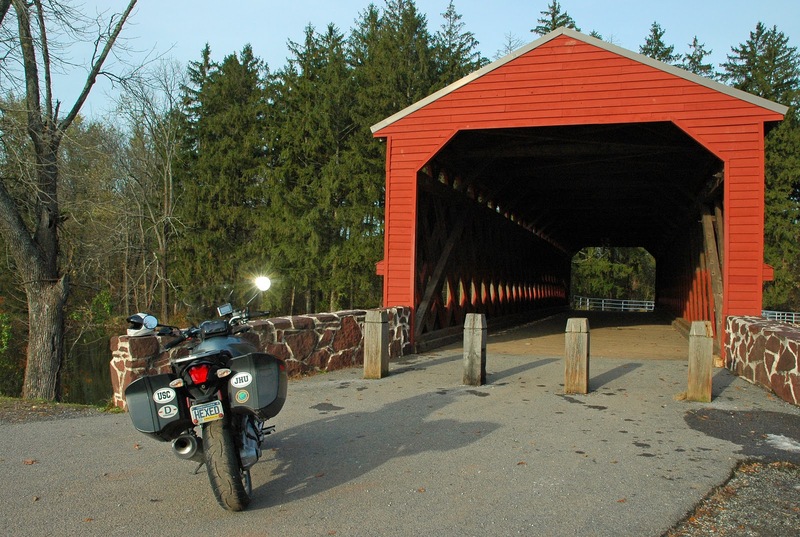 I wanted to get in one more long ride to north central Pennsylvania before the days get too short and the rural roads are covered with Highway Department gravel. It was colder than I expected for the first few hours--I was getting temperature readings as low as 23 in the low lying areas. The mountain crossings were mercifully a bit warmer. With my electric gear, the only thing uncomfortable was my feet and I fixed that when I put on my boot rain covers at the first stop. Some of the roads still had gravel from the snow a couple of weeks ago so for the first couple of hours, I rode much more slowly than I normally do, at times as low as the speed limit. I followed routes 144 and 44 through Snowshoe, Renovo, north to Ole Bull State Park and back through the town of Jersey Shore. Since the leaves are past peak, there were fewer wallowing minivans than a few weeks ago. I often had the road to myself and only got caught in one long string of cars behind a crawling water truck working for the gas fracking operations that are so common north of Interstate 80. I had to dodge a deer herd once and then almost ran into an Amish buggy coming around a blind curve in a state forest. I wasn't expecting a buggy there. I also set my personal motorcycle speed record on one of the deserted straight sections where I do such things. It turned into a gorgeous day once it warmed up into the 40s and 50s. Unfortunately, though, I forgot my camera bag so have no pictures. So I thought I'd pop down to Gettysburg after work--something I do often. I particularly like it on weekdays outside of summer when the crowds are smaller. But this turned into one of those rides that was more adventure than I'd planned. Last week we had the earliest snow I've experienced in Pennsylvania. As a result, the back roads, including the wonderful Route 233 through the Pine Grove and Michaux state forests, were covered with the nasty gravel that the Highway Department spreads. It accumulates in curves, leaving me terrified of having the bike slide out from under me as I leaned. Between the gravel and watching for deer which are rutting this time of year and particularly active (and particularly stupid), I was going 15-20 MPH slower than I normally would. But then I took a little rural road I'd never been on toward the battlefield. The way it looked through there, I thought I'd accidentally ridden all the way to West Virginia. But that road, in addition to being tiny, twisty, and badly in need of repair, was even more covered in gravel. I was crawling through the curves so slowly that I was holding up pickup trucks behind me. That never happens. I finally did make it. 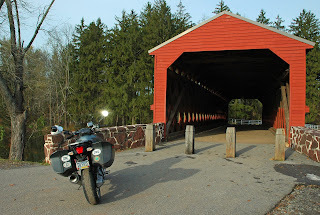 It was overcast by then so I didn't shoot any photos as I rode across the field where Pickett's Charge took place, but did take this one at Sach's covered bridge which is right outside town. Both armies crossed it during the battle.